The realism and detail of today’s 3D designs go a long way toward selling projects. Solution selling tactics that every contractor should know. According to a recent survey, skilled trade vacancies are the hardest jobs to fill in the country. Skilled trades (carpenters, welders, bricklayers, masons and more) have maintained the number one position in vacancies from 2010 to the present. And, with remodeling spending at an all-time high and expected to continue to climb through 2019, the employee scarcity is more noticeable than ever – especially in seasonal fields like hardscaping and landscaping. With the trade labor shortage in mind, hardscape business owners must be strategic as a means to expand services, maximize labor and allow teams to work smarter. Solution selling is an approach that accomplishes each of these goals. At the same time, it also delivers a final project that exceeds the client’s expectations through understanding their needs and solving problems with phased designs, modular elements and more. Using this approach, contractors are able to strategically sell more projects and save on time and labor – which are key differentiators in meeting business goals. Solution selling begins at the sales consultation, and it is critical to understand what is driving the homeowner’s decision. Whether the client wants to create an outdoor kitchen, a pool deck or is looking to solve drainage issues with a retaining wall, their final goal will affect many decisions along the way. For example, if the client is initially installing a pool and may add a pavilion and outdoor kitchen in the future, consider recommending that they install column footings and pre-run electrical and gas lines under the pool deck. 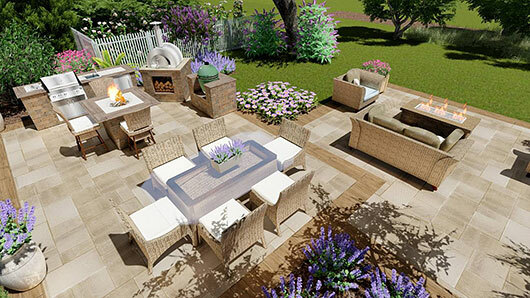 This presents the opportunity to discuss the client’s goals for their outdoor space. Though these larger projects may not be part of the initial work, this approach allows you, as the contractor, to bring a smaller scale project to life while creating the foundation for the future. The full plan can be presented in a phased approach and quoted so that the client can easily process how their outdoor space can reach its full potential. 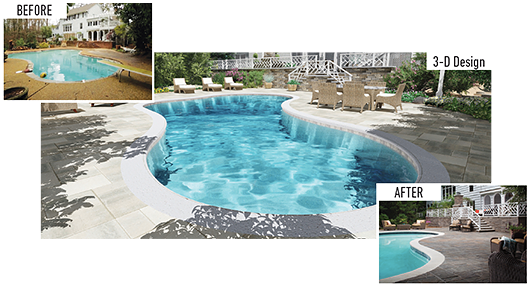 Contractors can drastically improve their sales and marketing materials by leveraging the design tools available through hardscape manufacturers, such as Belgard. Using a simple sketch, dimensions and images, design software can create 3D animations and virtual reality experiences that give homeowners a sense of the finished product in their backyard. In fact, these services have demonstrated an 80% closure rate for the contractors that use them. Jarett Crump, Landscape Designer with MW Lawn & Landscape Inc., notes that he has been able to use design software to visually communicate with both his clients and his crews throughout the design process and during construction. Eliminate questions upfront, making projects run more smoothly from start to finish. This leads to happy customers and, in turn, referrals and more repeat business. Reduce the amount of time spent on renderings, which increases the amount of time available for contactors to spend on selling and managing projects. Lead to increased ROI as the number of site visits needed to close projects decreases. 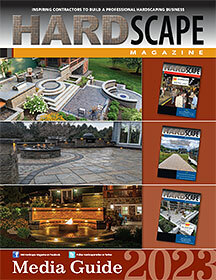 Help streamline the process of selling and installing hardscapes. Give them the ability to give customers a better visualization of the overall project and walk them through 2 to 3 view points of the design. 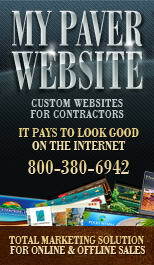 This gives contractors the opportunity to answer any questions that arise. The use of design software along with virtual reality and 3D renderings for small and large-scale hardscape projects allows you to differentiate your company as cutting-edge operation that utilizes the latest technology. These tools make it easy for you to show both clients and crews what the end-product will look like. In addition, it is important to provide design renderings for all phases of a project – especially if it is a solution sell and/or phased design – to ensure you give the homeowner and crew an overall vision of the completed project. Renderings allow the project designer, homeowner and crew to confirm how the project will match and flow before breaking ground – i.e., how colors will look together, how different features will interact with each other and how movement between spaces will be restricted or enabled. As part of your on-site conversations with the client, take advantage of the opportunity to educate the homeowner on add-on options to improve the project. Fire pits, water features, lighting elements and retaining walls that double as seating are simple additions to a project that can add tremendous value. In order to use crews more efficiently, it makes sense to add incremental fire pits, fireplaces, grill islands and more to an existing project versus selling several small ones. As you continue to expand your skills to provide additional design and installation services, modular elements and kits will create efficiencies. Because modular elements are pre-built, the degree of customization is more approachable, and the work is done faster and easier than ever before – opening up the prospective talent pool to more generalized labor. By using modular products, project managers can keep key employees on the most difficult builds while using other team members for quick modular construction. Pitching and adding modular elements that the homeowner may not have thought of is a quick way to increase revenues and satisfy a customer’s need without adding many days to a project. From outdoor fireplaces, fire pits, brick ovens, kitchen units, water features and outdoor living spaces, modular designs mimic natural stone at a fraction of the learning curve and cost. As consumers continue to adopt the “Amazon Mindset” and expect next-day delivery, it’s important for contractors, dealers and manufacturers across the hardscape industry to strategically use crews and easy-to-install products along with tools and technology to continue to drive profits. Solution selling and phased design give hardscape businesses the opportunity to make the entire project – from the design to the installation – a seamless process. Collaboration across parties and evolving concepts are the key to propelling the hardscape industry while mitigating the trade labor shortage. Since 1995, Belgard’s locally made and nationally backed products have transformed thousands of residential and commercial properties in North America. 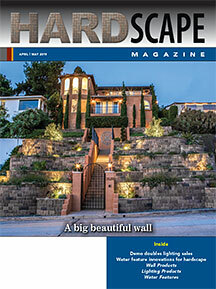 Belgard sets the standard for landscape design and innovation. 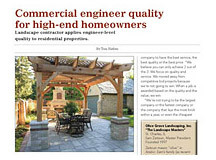 Visit Belgard.com or Belgard.com/professional-resources to learn about Belgard’s products and partner programs.